Japan Airlines, Jetstar Japan, Air Asia Japan and CAE management teams participating in a traditional Japanese “Kagami Biraki” ceremony held during the inauguration. 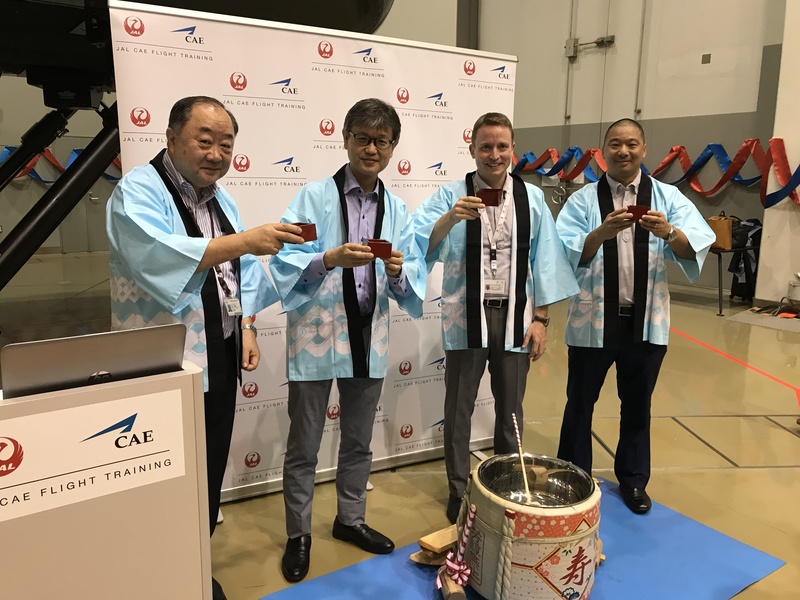 CAE announced last week the expansion of its pilot training capacity in Japan with the inauguration of its first Airbus A320 full-flight simulator (FFS) deployed at JAL - CAE Flight Training (JCFT), the joint venture between CAE and Japan Airlines, in Tokyo. The CAE-built Airbus A320FFS will support the pilot training needs of Japanese airlines and other airline customers across the region. Last June, CAE announced the deployment of the simulator to support the pilot training needs of Jetstar Japan. The simulator includes CAE’s latest innovation, the CAE Rise™ training system, allowing instructors to deliver standardized training in accordance with the airline’s Standard Operating Procedures (SOP). The ceremony was held on Friday, September 21st at the training centre located at Haneda Airport and was attended by Japan Airlines, AirAsia Japan, Jetstar Japan and CAE executives. “Customers in the rapidly-growing Asia Pacific region have increasing needs for training, and we continuously invest in CAE’s training network to fulfil our commitment as their training partner of choice,” said Nick Leontidis, CAE’s Group President, Civil Aviation Training Solutions. “I am proud to continue to grow our network and provide training services to our airline partners in Japan. It is our mission to offer the highest quality training to our customers with the most innovative training equipment”. With this training equipment addition, CAE Tokyo-JCFT will provide Boeing 737NG, 767, 777, 787 and Airbus A320 pilot training, bringing the total number of FFSs available at the centre to 9.